I’ve been finding all sorts of vintage plastic Christmas stuff at the thrift stores lately. 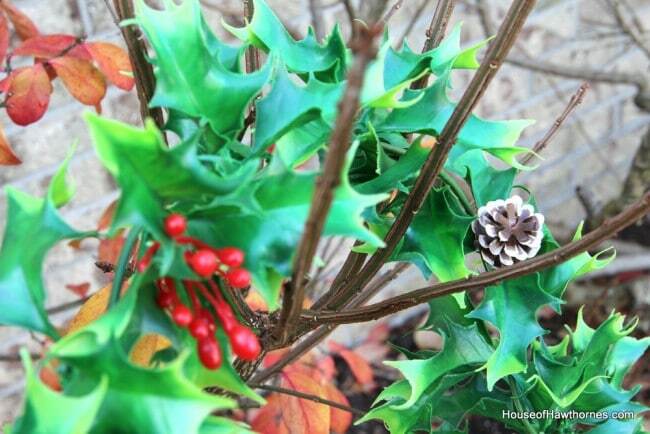 I sort of enjoy the fake holly leaves and even faker berries. I find it a little kitschy and it brings back memories of a time when America was proud of its ability to mass produce plastic Christmas decor (a.k.a. the 1960’s). So you don’t think I’m totally going off the deep end with thrift store Christmas decor – I maybe, just possibly, have decided not to put a set of blow mold candles on my front porch (said as she crosses fingers behind her back). It almost seems too awesome to have been sold at the Dollar Tree. What are your thoughts? Awesome deal at Dollar Tree or greatest thrift store find EVER? There’s no in between here where you get to say it is sort of ugly and worthy of a trip back to Goodwill! 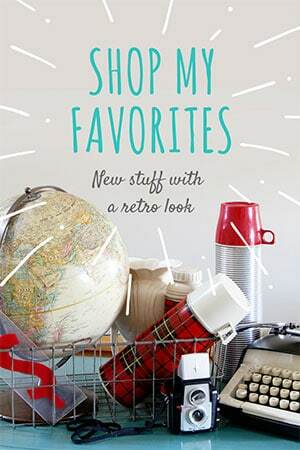 Linking with Vintage Inspiration and Junkin Joe Vintage and Thrifty Finds. I think that the vintage plastic Christmas decorations are under appreciated. I like them too. I just purchased a vintage white plastic wreath that I will be decorating. That little tree is darling. Well, let me add my two cents: Those plastic berries hold up much, MUCH better outdoors than their other ‘faux’ counterparts, which, at the end of the season have been pecked to death by the birds and have faded. I like all your finds! You’re speaking my language! I’ve got boxes of estate sale plastic holiday treasures that I can wait to pour through again. I have to agree – it does hold up!! I saw a plastic 60’s wreath in GW on Tuesday. Right now basically Christmas thriftin is almost hopeless. Everything I got today was pink and pastel. But I need calm as CC is lost in the middle of the state somewhere driving home. Valium cocktail anyone? 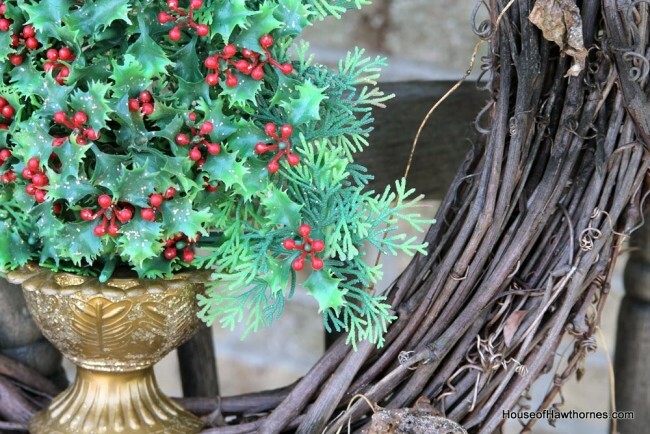 Loving the plastic holly ~I will take vintage plastic decor over the inflaeatable kind any day! I’m glad they think it’s ugly…the prices will stay low! Great finds! I have blowmolds. Not on the porch but out in the front yard. I still use c5 or c7 big colored bulbs too. I don’t have any vintage plastic wreaths. I don’t see vintage Christmas stuff very often. I think it is fairly hard to find here. I can not believe it, but it’s been close to 18 years since I found an old plastic wreath tossed near a dumpster behind a church. 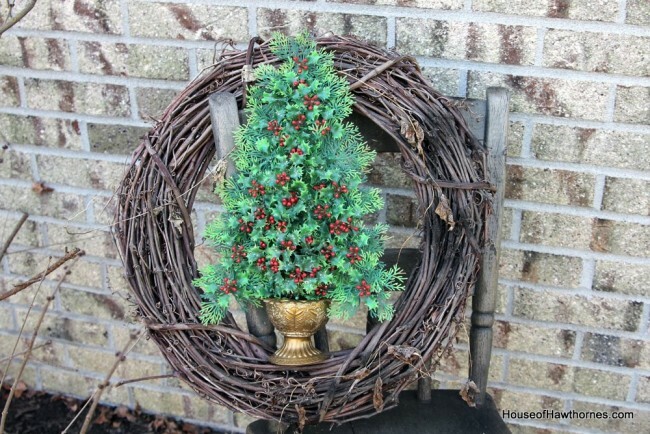 No berries, just boxwood type greenery. I scooped it up and slipped it home. Little repair, little ribbon, and some fake berries added…each Christmas it hangs on a tree near my back steps…good ole fake plastic wreath, anything else would be long gone by now! Thanks for the memory and support of plastic. OOOOOOoooooo cute plastic. You are so funny. It’s funny the things that bring back happy memories of childhood Christmases, Pam! I have to say, I do love that wreath. Hehehe! The best part of the plastic decor is that you can just take the outdoor hose to them when they get dusty! I think your tree is a vintage…..deal? I well remember the plastic candle rings my mother used in the 1970s. Ah yes. I’m afraid I haven’t been able to re-embrace the plastic look yet. Okay! I love it! Yes, it is a great vintage Christmas! Where plastic looks fantastic, and adding glitter makers it better! I really like the plastic tree! Looks too cool for Dollar Tree! I love all the plastic decorations. You’re right, it does remind me of the 60’s and home! Best Goodwill Find Ever! The tree looks to detailed to be from the Dollar Tree. I love the subtle glitter on it. I too love vintage plastic Christmas and can’t wait to get all of mine out for the season. I like your vintage plastics. 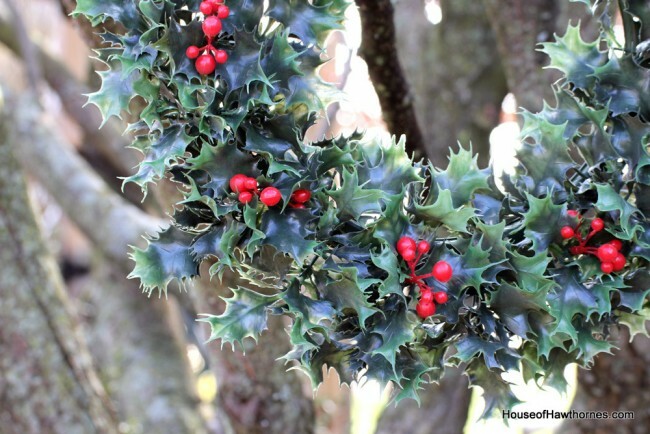 The holly garland and wreaths with red berries makes a little spot of color and holds up to the elements.I would love to have the money to put out multi foot long garlands of real holly. 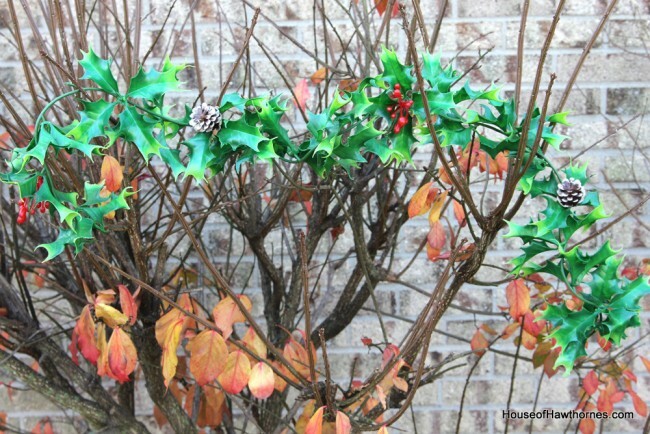 I used to buy a huge live evergreen wreath for the front door, but last year they just seemed too expensive. 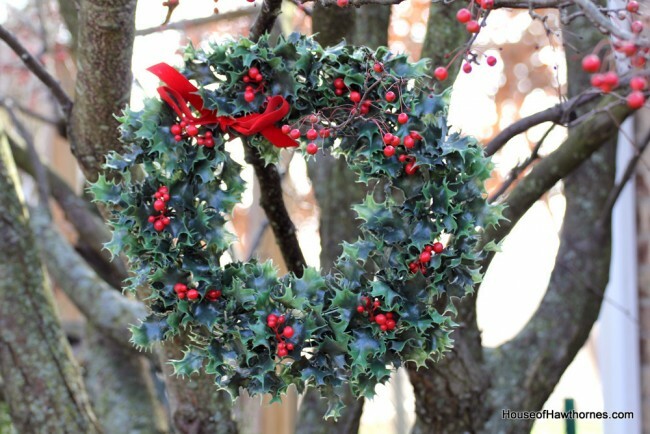 One year I made a beautiful, big, cranberry wreath (a la Martha Stewart). Within two days it looked like it had mange. I thought someone had been vandalizing it. They were just leaving the toothpicks stuck in the styrofoam. Then one day when returning home, I pulled up in the car and caught the vandal. He was the fattest mockingbird you have ever seen. Quite well fed on cranberries. I guess he thought it was a fancy birdfeeder. Anyway, maybe we should keep our liking of the vintage plastic decorations quiet or they will raise the prices on them, too. We plastic admirers need a secret handshake or signal or code word. Put my vote in the “best thrift store find ever” column! Love the little tree in all is plastic’y charm!!! Ahhh….what an American Christmas! SO vintage, so full of memories…I haven’t busted out my plastic Christmas gear yet, but I have my stash, too! I think the tree is darling! It’s perfect for that back-porch door…that’s where my grandma would hang it. A little something here, a little something there… bring back my vintage Christmas everywhere. Good lord lady! You find the best stuff. It all reminds me of my childhood, I swear we had a wreath just like that when I was little. I’m liking the ivy tree thingie – it’s a great score. I like them! Best part is, you got them for a song so if you tire of them eventually, no big deal to pass them along to another thrift store. 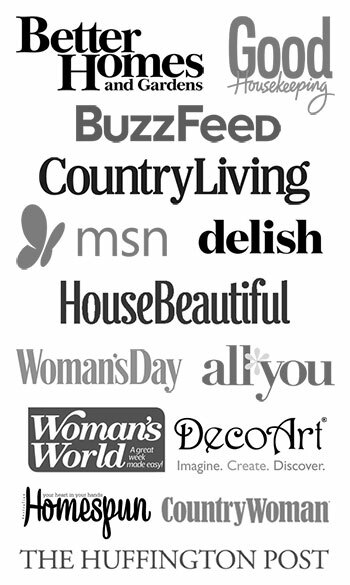 Their different than what you find in the stores now days… and I like that.